How do I copy or clone or duplicate the data, structure, and indices of a MySQL table to a new one? Apart from the solution above, you can use AS to make it in one line. Go to phpMyAdmin and select your original table then select "Operations" tab in the 'Copy table to (database.table)' area select the database where you want to copy and add a name for your new table. I found the same situation and the approach which I took was as follows: 1. Execute SHOW CREATE TABLE : This will give you the Create Table syntax for the table which you want to clone 2. 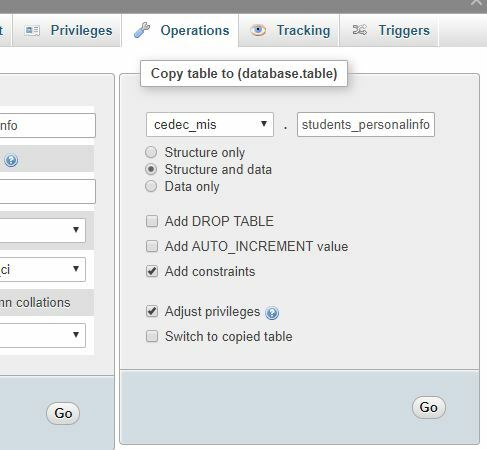 Run the CREATE TABLE query by changing the table name to clone the table. This will create exact replica of the table which you want to clone along with Indexes. The only thing which you then need is to rename the indexes (if required). After tried the solution above. I come up with my own way. My solution a little manually and need DBMS. second open the export data. third replace old table name with new table name. fifth import your edited sql data to the database. this avoid the INSERT AS SELECT statement that, in case of table with a lot of records can take time to be executed. This SQL is used for copying tables, here the contents of oldCustomersTable will be copied to newCustomersTable. Make sure the newCustomersTable does not exist in the database. How to add AUTO_INCREMENT to an existing column? How might you clone a database table via Rails migration? Copying Mysql database table with PHP, does not give exact copy as like operation function copy table in phpmyadmin? How to copy data from one table to another new table in MySQL?